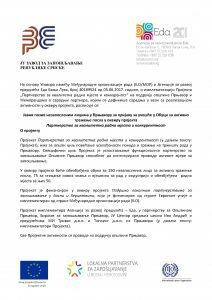 Within the project „Partnership for quality jobs and competitiveness“, public call for unemployed persons from Prnjavor for participation in the training for active job search was published. The training is free and it is designed for unemployed persons with a place of residence in the Municipality of Prnjavor, who are registered in the records of the Public Employment Service of the Employment Bureau – Biro Prnjavor as active jobseekers. The deadline for submitting applications is 17 October 2017 and more information on applying is available in the public call which can be downloaded here.